Thoughts on food, health and life. Keeping the variety going for babies is so important yet can be quite a demanding thing to do amidst juggling the piles of washing, the milk feeds and all that mummy-hood brings. So here are a few ideas to help you out…. We tend to keep lunch as a snack meal, and dinner is our cooked meal but it doesn’t matter which way round you do things, whatever works best! We are often out and about at lunchtime so it’s easier to take cold food that doesn’t need heating and isn’t too messy to eat. I have a baby who likes to share my lunch so we often eat the same. Rice-cakes with cottage cheese or cream cheese and grapes. Cream cheese and grated apple sandwich. Pitta bread with avocardo and grated carrot. Rye bread with avocardo and tomato. Bagel with hummous, try different flavours. Scrambled egg cooked with peppers on toast. Cous cous with chicken, sultanas, peas and sweetcorn. Tuna rice salad – mix cooked rice with tuna in spring water, chopped cooked. peppers, grated carrot and cucumber, dress with red wine vinegar and olive oil.Our favourite this week is a spiced cauliflower hummous. Yum yum. Here’s my little one enjoying it! Pilates Instructor running a variety of classes, Freelance Dietitian, Mum, and I help run a project called Young Hope that supports orphaned children in Sri-Lanka. 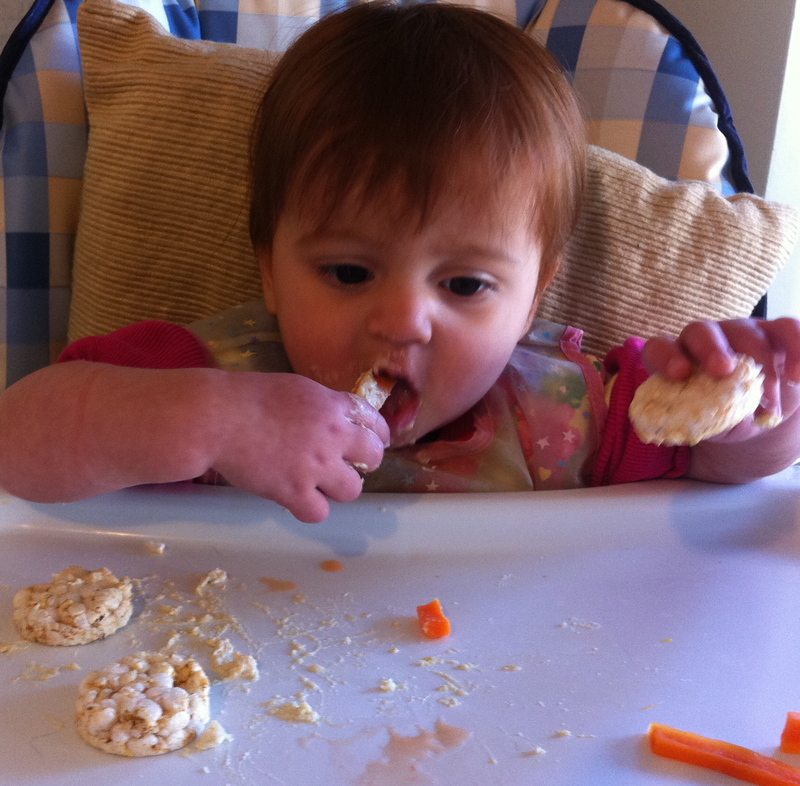 This entry was posted in Uncategorized and tagged baby food, baby lunch, baby recipes, dietitian hampshire, southampton. Bookmark the permalink. Nutrition in the Under 5’s: an overview. Tips to reduce food waste.